Some candy for your eyes. Poll: How many of you keep candy corn at your house? Add salted peanuts to the candy corn stat, you will thank me later. Salty, sugary goodness will ensue, just saying. i wish. if only it were vegan. sigh. Not me. We can't even get candy corn in New Zealand :-( I always wondered what it tasted like though. I used to hate candy corn...then I got married so we had it around for him...then I got pregnant, and I um, I snuck a bite, then one more, then the whole bowl was gone...so now we have it around for all. I can't keep candy corn at my house. I begin eating it in the store and by time I get home it is gone. I have a serious love for them! have you tried the caramel flavored candy corn??? DANGEROUS! they don't sell it in australia. gasp...i know. I would like to, but I'm terribly addicted! Literally I will not stop eating it until I'm sick. Yuck!!! Candy Corn belongs on the shelves at the grocery store...in my opinion. I can't explain why, but even as a child I couldn't stomach them. Its quite sad, since they are pretty little candies. I have bought candy corn twice already to put in a pretty little bowl and stare at....and twice my family has emptied the bowl in less then an hour. It's kinda cute how they all sneak around grabbing a handful when I'm not looking ;) so I may have to buy a 3rd bag. ick- try as i might, i just can't do candy corn! My husband LOVES candy corn but I only have it in the house around Halloween. This year I filled a huge hurricane glass with candy corn around a candle for a fall decoration and found out my daughter was eating them out of that! Well, how do you define "keep" exactly? LOL! I buy it and I love it...so it doesn't always last very long! LOL! I have a bag in my studio right now! I stole some to take to work with me today in an adorable little pumpkin container! i keep it at my desk. i spend more time at my desk than my house, so i think that counts!! Oh, yes. Candy corn is an autumn staple around here. And no fear of me gobbling it all down, with all the littles that love it, too. 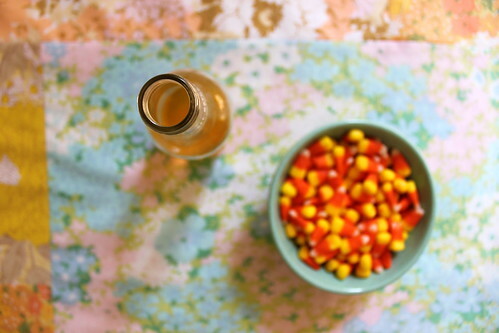 I keep candy corn at my house--my latest post proves that! ah i haven't had candy corn in yyeeaarrss. I just told me kids that we need to go buy some. I love how pretty it looks. Have you seen the cover of Woman's Day (I think it's that magazine)? It is filled with great candy corn crafts. I Do! Plus I'm about to have a "candy corn forest" in my front yard - 14 little wooden candy corns! Just waiting for the last coats of paint to dry! I will try and send you a pciture once they are in place. I would love to have me some candy corn in the house, but...it makes my kids NUTS! I won't buy a bag--for just three of us a big bag is a lot of sugar. But, one of the secretaries at the campus I teach at has some, so I swing my a couple times a week in October and spoon some out. She decorates, both the walls and the tummy, for every holiday, so I can get my fix of almost any seasonal treat without having to actually bring it home from her. It's a nice system. I don't eat them, but I do buy some, it's totally nostalgic. My son will eat them, but I mostly think of my mom because she loves them. They alo look really great in photos. I have no idea what candy corn is. Is it corn with honey on? Or popcorn? I get a craving for them every couple of years. I found myself in line at the drugstore the other day with candy corn and toothpaste (what I actually went in for.) Ironic. We like candy corn over here, but we really love the candy pumpkins better! Ha Ha! I posted about the same thing today only mine is candy pumpkins! Can't keep it in the house. I'd eat the whole bag in an afternoon or two! YUM! Hah. I had a bad encounter with candy corn when I was young. Haven't touched them since. We have a glass jar full of candy corn in our Halloween display. It started with a 2 pound bag and now the container is half empty...ugh, that means one whole pound of candy corn has been put into my body. And yes, salted peanuts mixed with candy corn is the BEST! Fun fact: I've never eaten candy corn. Candycorn = nectar of the gods. If nectar came in striped triangle bites of deliciousness. If by "keep in the house" you mean purchase, inhale, repeat - then yes. Definitely. Can any of you across the pond tell me, which is the best brand to buy? me! me! actually candy pumpkins but i think i like corn better. i love the mixture with peanuts or pretzels too. I die for the marshmallow creme pumpkins. but I love candy corn too!